more significant decreases than increases. Good news! Rainfall intensities have been decreasing in Ontario, Canada's most-populated province according to newly-released data. Less intense rain means lower urban flooding risk, contrary to many media reports that have confused future predictions of more extreme weather as a climate change effect with actual observed changes in the past. Maximum annual rainfall amounts over short durations at Ontario climate stations are used to derive engineering design intensities used in design of infrastructure such as sewers, culverts, channels, and ponds - the things that help convey rainfall runoff safety away from otherwise vulnerable people and property. The previous Version 2.3 datasets showed decreasing annual maximum values at 21 southern Ontario climate stations with at least 30 years of observations - see previous post. There are 42% more decreasing trends than increasing ones across all durations and stations (55.6% decreasing trends vs. 39.2% increasing ones). There are 75% more statistically significant decreases than increases (7 significant decreases vs. 4 significant increases). This table shows the station name, ID, trends for each duration of 5 minutes to 24 hours, as well as the length of record and the most recent year in the Version 3.0 dataset. There are no statistically significant increases for durations less than 6 hours - that means the short duration convective storms burst that can lead to urban flooding related to most infrastructure systems do not show any appreciable increases. Overall downward trends are contrary to insurance industry statements, particularly the disproved "Telling the Weather Story" claim that there has been a one standard deviation increase in the probability of extreme rainfall according to Environment Canada data (the "Story" was only a theory/concept incorrectly cited and widely misreported as real data). Article clarifying the "Weather Story" and discussing effective means of mitigation. Article highlighting media inaccuracies on extreme rainfall reporting. Article questioning City of Toronto statements on more extreme rainfall as a cause of flooding that are not supported by data or statistical analysis of frequency or trends. Urban flooding is certainly an important issue to be addressed. And there are many factors that affect today's flood risks as explored in a previous post. While the insurance industry has suggested a link between increasing flood damages to increasing rain extremes due to climate change, given the wealth of evidence pointing to other quantifiable factors like increasing hydrologic and hydraulic stresses - and no change in rainfall extremes! - means that there is not even a correlation much less a causation relationship between flood damage and rain extreme trends (i.e., damages are up but rain intensities are down). This was pointed out in my Financial Post OpEd. Recognizing trends in observed rainfall maximum values and the derived design intensities will support data-driven, evidence-based policies and programs for achieving flood resilience through strategic infrastructure investments. The table expands into higher latitude eastern Ontario communities including Kingston and Ottawa as well as to northern Ontario. The eastern Ontario climate stations show an overall consistent trend in decreasing observed rainfall maxima over the shortest durations. Another eastern Ontario station, the Ottawa Airport also shows decreasing trends over short durations, including several statistically significant decreases (i.e., lower observed rainfall intensities) for durations of 10 minutes, 15 minutes and 1 hour. Previous analysis of the Version 2.3 datasets showed the differences in southern and northern Ontario trends. Increases in intensities in the north, beyond Ontario's largest urban centres, could reflect a shift toward more rainfall events instead of snowfall as a result of warming temperatures. Everyone has an opinion on the weather and media is saturated with stories linking extreme weather with flooding. It makes sense. Flooding happens during severe storms. The bigger the storm the bigger the flood damages in fact. But media and groups including the insurance industry and some researchers have suggested that flooding and flood losses have increased due to changes in weather patterns characterized by increased intensity or frequency of rainfall events. That is not true. And there is no data to support that explanation. 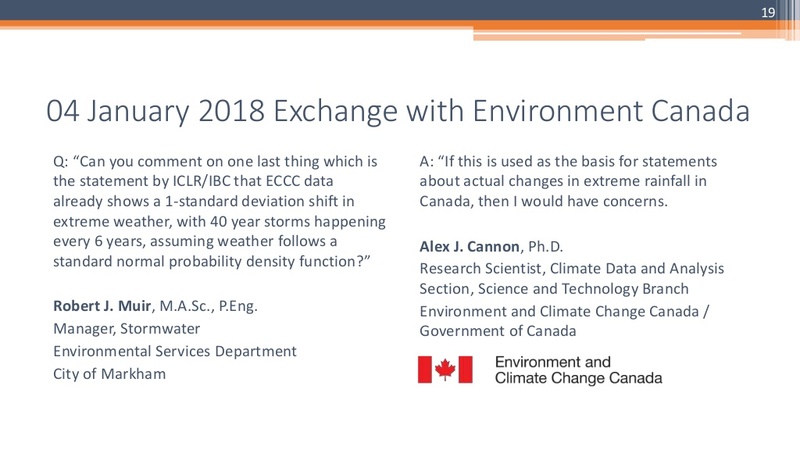 Because rainfall intensities have not changed according to official Engineering Climate Datasets that review and analyze trends in extreme rainfall to inform engineering design across Canada. Some media are correcting this false explanation that new wild weather, or a new normal, is causing flooding, like the CBC. "Review by the Office of the Ombudsman, French Services, CBC/RadioCanada of two complaints asserting that the articles by journalist Marc Montgomery entitled How to mitigate the effects of flood damage from climate change and Response to a climate change story, posted on September 19 and November 19, 2018, respectively by Radio Canada international (RCI), failed to comply with the CBC/Radio-Canada Journalistic Standards and Practices regarding accuracy and impartiality." 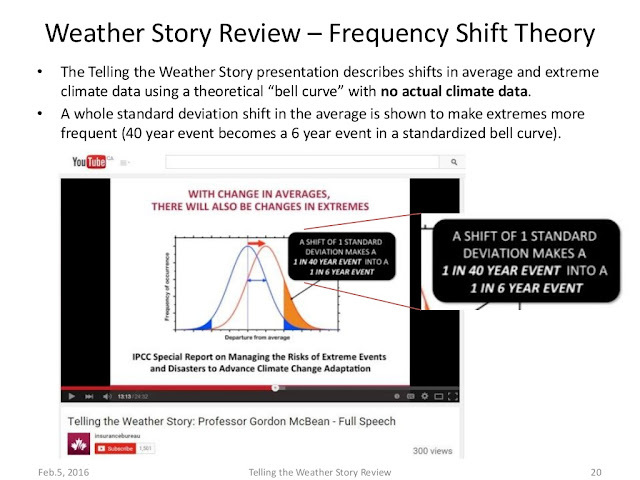 While Environment and Climate Change Canada have refuted insurance industry claims on storm frequency shifts in the past (see Canadian Underwriter correction on the IBC/ICLR Telling the Weather Story theoretical shifts mistakenly reported as real data). Yet the insurance industry has continued to promote the 'causation', with opinion pieces (not any peer-reviewed paper or analysis) saying climate-change effects on rainfall drive flood losses. See Financial Post piece. If not rainfall, what causes more flooding, more flood damages? i) "Expert evidence confirmed the effect of the city's rapid urbanization and water control plans on the creek." iii) "There can be no doubt that the storm sewer facilities and urbanization of the lands to the north of the Club are the cause of the effects just described and that the difference in flow and velocity of flow is very substantial." "There is limited to medium evidence available to assess climate-driven observed changes in the magnitude and frequency of floods at regional scales because the available instrumental records of floods at gauge stations are limited in space and time, and because of confounding effects of changes in land use and engineering. Furthermore, there is low agreement in this evidence, and thus overall low confidence at the global scale regarding even the sign of these changes." IPCC notes low confidence in the sign of changes at a global scale, meaning flood magnitudes could be going up or down. Other factors driving losses? Research shows for some severe weather event types like hurricanes the driver is GDP growth, e.g., "research is robust in concluding that, for many decades into the future, the primary driver behind increasing economic losses related to hurricanes is expected to be societal growth"
"Since its construction between 1914 and 1922, the Keating Channel has been subject to heavy sediment loads, requiring regular dredging to maintain sufficient depths to allow for and maintain shipping activities at the mouth of the Don River. Between 1950 and 1970, widespread development throughout the Don Watershed and the construction of the Don Valley Parkway increased sedimentation rates by up to four times that of the pre-was era. After 1970, decreases in the number of new watershed disturbances and improved sediment control structures likely contributed to the decline in sedimentation in the Keating Channel to levels similar to the pre-war era. A reduction in shipping activities within the Keating Channel, combined with restrictions on the open water disposal of dredgate imposed by the International Joint Commission (IJC) in 1974, resulted in a cessation of dredging in the Keating Channel. In the following five to six years, the Keating channel filled with sediment and debris to the point where it became visible under all but high lake levels, resulting in increased flood risk along the lower Don." So flood risks increase due to fluviogeomorphology (the transport and deposition of sediments in a watercourse) and hydraulics - when dredging stops, sediment builds up, hydraulic capacity is reduced and flooding is increased along the river. "So when you see in the news and the media people talk about storms seem bigger and more intense and so forth, those perceptions are correct. And there's a lot of data to show it." "The presentation looks to be a simple conceptual model for communicating the underlying idea – if one assumes a standard normal, then a shift in the mean implies an attendant change in extremes – which is fine as far as it goes. If this is used as the basis for statements about actual changes in extreme rainfall in Canada, then I would have concerns." The 'green' shift to the left reflects an overall decrease of 0.4% in rainfall design intensities at 21 long term climate stations since 1990, considering durations related to urban flooding, i.e., 5 minutes to 24 hours. That analysis of the new Version 3.0 Engineering Climate Datasets was presented in this post. In this region, the extremes can be expected to decrease along with the means - on average that is happening too for the 100 Year rain intensities. The Environment and Climate Change Canada report notes 'medium confidence' in increases in annual precipitation across the country and "low confidence in quantifying regional or national total amounts of precipitation" - so medium confidence in it going up but low confidence in saying how much, especially at more local spatial scales, or regions. Since little or no infrastructure is designed to address annual precipitation, the reports limitations on the annual precipitation statistic are irrelevant to cities facing challenges like urban flooding during extreme, short duration events. Based on CatIQ datasets, a higher number of flood claims and a higher value of claim is associated with rare storm volumes falling over duration of minutes and hours and not annual totals. The key take-away is that extreme rainfall has not been observed to change, whether for higher frequency events like 2 Year storms, or for low frequency, rare events, like 100 Year storms. 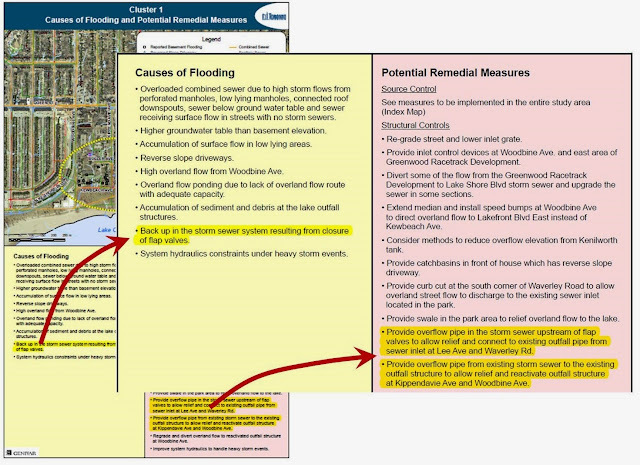 This is consistent with reporting by the American Society of Civil Engineers who in their Adapting Infrastructure and Civil Engineering Practice to a Changing Climate document state: "It is important to point out that land-use changes (e.g., urbanization) can result in substantial flooding impacts, independent of climatic forcing functions." - see page 12.
convective storm activity such as might be related to anthropogenic climate change." That analysis was intended to 'disentagle' the impacts of climate change and land use change. Green bars are pre-urbanization coefficients showing we had a small fraction of rain becoming runoff, while blue bars show significant increase in runoff potential after 50% urbanaization. 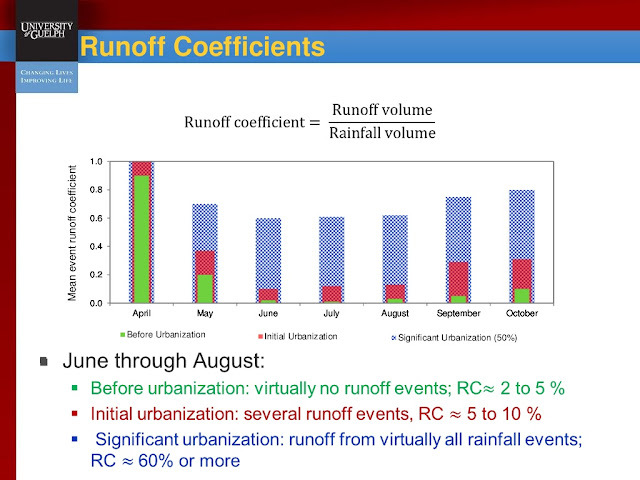 Note there is uncertainty in flow monitoring too, just like in precipitation monitoring, but we see a 10 times, 1000% increase in runoff potential in summer months, when we have the highest rain intensities, due to urbanization. The urbanization effects are MASSIVE - the Scarborough Golf court case reiterated this fact over and over referring to "markedly increased flows". Compared to urbanization effects on flows, meteorologic effects are a big "nothing burger", with no observed changes and just a lot of theory and speculation. 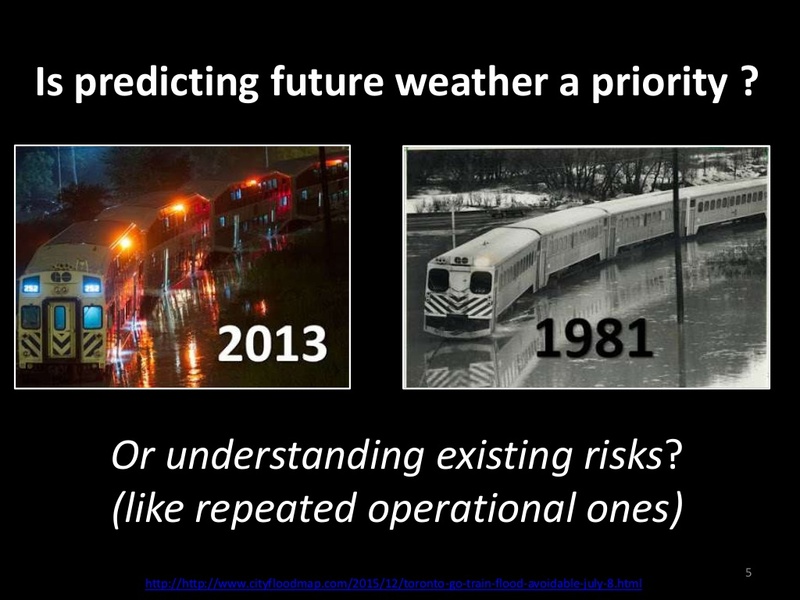 We should design for uncertainty in the future, and incorporate cost-effective adaptation considerations or flexibility for future adaptation (ASCE's Observational Method for climate adaptation) however we should not mischaractierize past trends and risk factors driving today's infrastructure performance limitations. The Environment and Climate Change Canada report recognizes the impacts of temperature on snow patterns in Chapter 4: "As temperatures increase, there will continue to be a shift from snow to rain in the spring and fall seasons.". The report also cites research that "The reduction in spring snow pack and the ensuing reduction in summer streamflow in British Columbia have been attributed to anthropogenic climate change". Other cited research notes "Such a change in the form of precipitation, from snow to rain, has profound impacts in other components of the physical environment, such as river flow, with the spring freshet becoming significantly earlier." 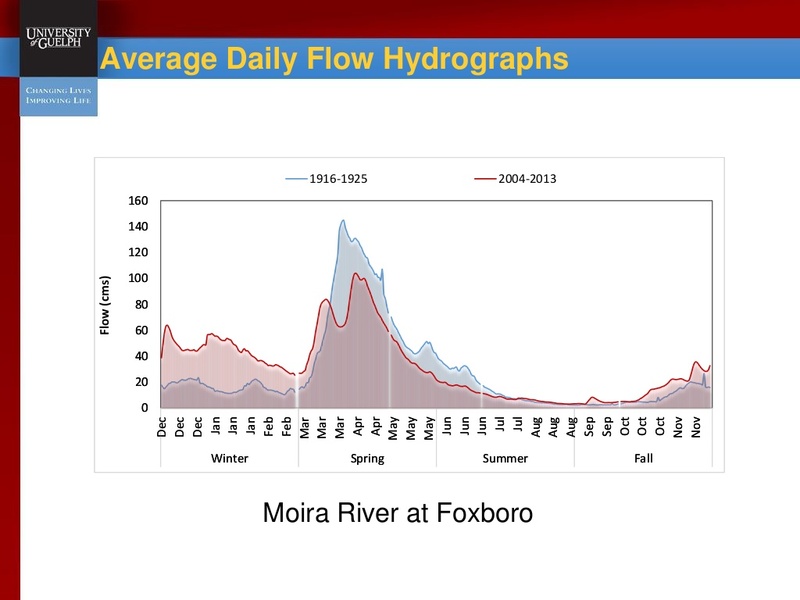 - the University of Guelph research shows that the winter period flows increase from November to early March in the Moira River example, and the peaks decrease significantly from late March and April. This decrease in peaks will result in a decrease in spring flood risks in watershed affected by such events. So there is no new wild weather, or new normal driving flood damages. Case law in Ontario defining the effects of hydrology, or urbanization, findings of inquiries into Don River flooding for Premier Davis, Municipal Class Environmental Assessment studies investigating basement flooding causes and solutions, and Environment and Climate Change Canada's Engineering Climate Datasets that examine trends in observed rainfall intensities show us that hydrology, hydraulics, fluviogeomorphology explain today's flood risks, and there is has been no shift in rainfall intensities, despite median and insurance industry 'weather stories' and claims. 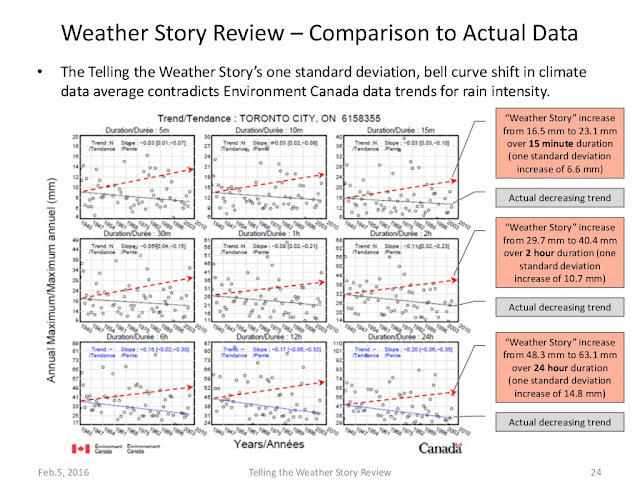 "For Canada as a whole, there is a lack of observational evidence of changes in daily and short-duration extreme precipitation." ECCC suggests there is insufficient data to observe the changes in extremes expected: "Estimating changes in short-duration extreme precipitation at a point location is complex because of the lack of observations in many places and the discontinuous nature of precipitation at small scales." - while that MAY be accurate for extreme events that are rare and elusive, why do 2 Year rain intensities, derived from many, many yearly observations at all long term rain gauges, show the clearest decline, across all durations from 5 minutes to 24 hours? Surely, we have DO enough point locations and observations to see the change in these small storms. But if these small frequent storm intensities are no higher with today's temperature shifts, why do we expect the extremes to be higher either? Data we do have shows in southern Ontario these 100 year intensities are 0.2% LOWER on average. So extremes are shifting shifting along with the means.... shifting lower. See the difference between theory and data? It is pretty clear. Given the lack of past trends, and uncertainty in future noted in the ECCC report ("It is likely that extreme precipitation will increase in Canada in the future, although the magnitude of the increase is much more uncertain"), we must follow the American Society of Civil Engineer's recommended "Observational Method" approach see 2015 report Adapting Infrastructure and Civil Engineering Practice to a Changing Climate at http://theicnet.org/wp-content/uploads/2015/07/2015-07-ASCE-Practice-to-Climate-Change-2015.pdf, and also see https://ascelibrary.org/doi/book/10.1061/9780784415191?utm_campaign=PUB-20181023-COPRI%20Alert&utm_medium=email&utm_source=Eloqua# for the new 2018 manual on engineering practice Climate-Resilient Infrastructure, Adaptive Design and Risk Management. The ASCE 2018 manual promotes incorporating any no-regret, now cost measures in design today considering most probable future conditions, and allowing design flexibility to adapt in the future if and when performance is shown to be inadequate or affected by future changes - this is a practical approach intended to avoid costly over-design, and over-investment in potentially unnecessary and cost-ineffective infrastructure today. While the ASCE 2015 report notes the high degree of uncertainty "However, even though the scientific community agrees that climate is changing, there is significant uncertainty about the location, timing and magnitude of the changes over the lifetime of infrastructure." In contrast, the ECCC report appears to asset a high degree of confidence in future changes saying "For Canada as a whole, there is a lack of observational evidence of changes in daily and short-duration extreme precipitation. 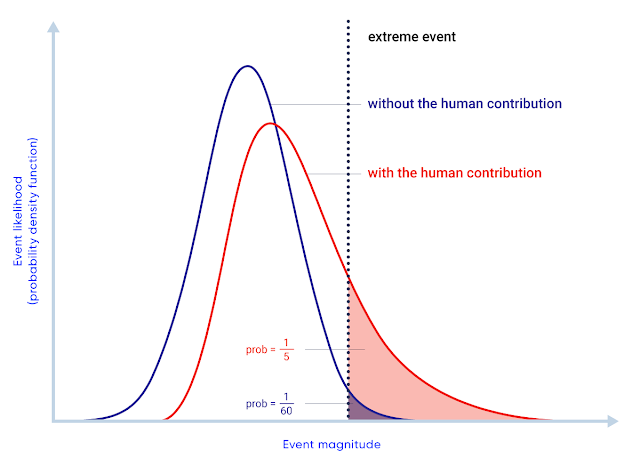 This is not unexpected, as extreme precipitation response to anthropogenic climate change during the historical period would have been small relative to its natural variability, and as such, difficult to detect. However, in the future, daily extreme precipitation is projected to increase (high confidence). - how can ECCC assert high confidence when there are no observed trends? How can ECCC contradict ASCE's statement on high "signifcant uncertainty'? ECCC reports that summer precipitation is expected to decrease: "Summer precipitation is projected to decrease over southern Canada under a high emission scenario toward the end of the 21st century, but only small changes are projected under a low emission scenario." - how can that be if the summer temperatures are going up? Does this not violate the Clausius-Clapeyron theory cited in the ECCC report states that "increased atmospheric water vapour in this part of the world should translate into more precipitation, according to our understanding of physical processes" - so that is a theory - what about the real data? What does it show? the Clausius-Clapeyron relationship does not stand up to scrutiny as shown in a previous post. Given highest rainfall extreme are in the summer (see the work of Dr. Trevor Dickinson on seasonal extremes), a summer decrease in precipitation could potentially mean lower flood risks. The data for southern Ontario already show a decrease in the annual maximum series (reflecting lower means and typical 2 Year design intensities in derived IDF curves) and the extreme 100 Year design intensities are decreasing slightly as well. 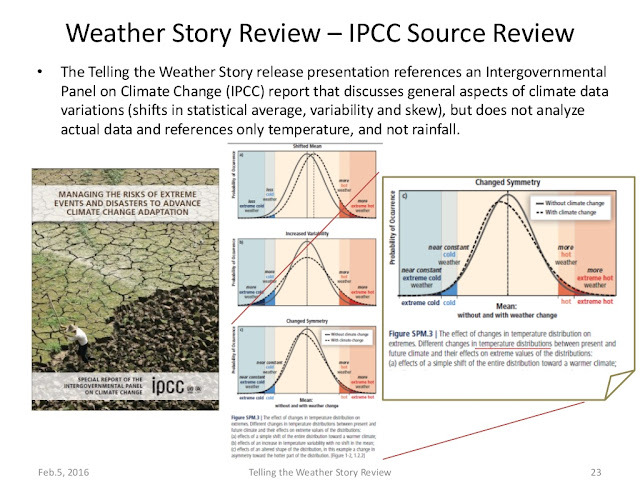 Overall, many in the media have over-hyped concerns about changing rainfall severity. Data and ECCC's report shows there has been no change, beyond random fluctuation. Looking ahead the American Society of Civil Engineers indicates that future changes have "significant uncertainty"- this contracts the ECCC's statement on "high confidence" on future extremes.